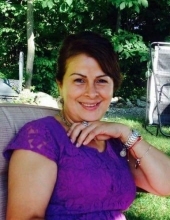 Patricia L. Quintana, a 35 year resident of the area, died unexpectedly on Sunday, January 27, 2019 at her home. She was 54. The daughter of the late Bernardo Quintana and Blanca Molina, she was born on October 18, 1964 in La Virginia, Colombia. She was a loving and accepting person who always made everyone feel welcome in her home. Patricia loved parties and dancing and had a great sense of humor. She was a savvy shopper and because of her generous nature, she sent many gifts back to Colombia to people in need. Patricia had a lively spirit that made her fun to be around and a great friend to have. Her beloved dog, Manchas, was at her side until the very end and will miss her dearly along with all of her family and friends. Patricia is survived by her brothers James Quintana and his partner, Nadia of Middletown and Walther Quintana and one sister, Julieth, as well as many nieces and nephews. Visitation will be held from 2 to 4 and 6 to 8 pm on Saturday, February 2, 2019 at Applebee-McPhillips Funeral Home Inc., 130 Highland Avenue, Middletown, NY 10940. A Celebration of Patricia’s Life will take place at 6 pm at the funeral home, Fr. Alejandro Sanchez will officiate. Cremation will private. Arrangements are under the direction of Applebee-McPhillips Funeral Home, Inc.
To send flowers or a remembrance gift to the family of Patricia L. Quintana, please visit our Tribute Store. "Email Address" would like to share the life celebration of Patricia L. Quintana. Click on the "link" to go to share a favorite memory or leave a condolence message for the family.